Feet and Footwear - Explore! Feet and Footwear - Explore! A lot of exploration can be done in a car, on horseback or even in a wheelchair, but if you want access to the most remote places, your feet will provide the best transportation. I’m not a podiatrist, so I won’t offer any medical advice, however, I do have feet and I do explore using them. This is the story of my feet and the footwear I have used over the years. Like most people, I use different footwear for different purposes. Although this story reads chronologically, bear in mind that I tried various things at the same time. While your feet are different and what works for me may not work for you, I hope that this story will help you get to footwear that works for you more quickly than I did. Early on I discovered the cheapest jogging shoes at Wal-Mart and I loved them. They were light, comfortable and a joy for walking. They did have some issues. Next I tried something called “skate shoes.” The salesman told me skateboarders liked them because they offered more stiffness and support. They looked pretty much like sneakers, but they did have a thicker sole than the joggers. The sole offered better protection on rocks. The low cut offered nothing for my ankles. It was while wearing these shoes every day that I learned about plantar fasciitis. According to Wikipedia: “Plantar fasciitis is a painful inflammatory process of the plantar fascia, the connective tissue on the sole (bottom surface) of the foot. It is often caused by overuse of the plantar fascia or arch tendon of the foot. It is a very common condition and can be difficult to treat if not looked after properly. Another common term for the affliction is ‘policeman’s heel’.” With this affliction the heel and sometimes the ball of your foot, or both, hurt. The defining characteristic is that you may walk around all day without pain then after a night’s sleep, the first steps in the morning can be excruciating. 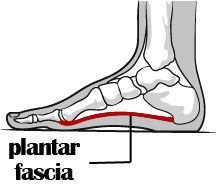 The plantar fascia is a ligament that is attached at the heel and ball of the foot as shown in the diagram. Inflammation, caused by tension at the two attachment points, is what leads to the pain. Overnight, there is no tension on the ligament and it contracts a bit. When first putting pressure on the foot in the morning the tendon pulls more on its end points, generating more pain than after it stretches out a little. I also have flat feet. That is, my arch is very low. A low arch tends to put the heel a bit farther away from the toes than a higher arch. This adds tension to the plantar fascia and is often associated with plantar fasciitis. My doctor advised stretching exercises. He told me to stand on a stair step with my toes on the step and my heels hanging over the edge. Then, drop my heels down slowly and repeat. This puts tension on the calf muscles and the achilles tendon that runs up the back of the leg. By stretching them, the idea is to give the plantar fascia a bit more slack. I found that I could achieve the same effect in the shower by leaning forward with my hands on the wall and my feet back and my heels flat on the floor. I also found that while in this position I could roll my feet outward, and raise my arch, to put even more tension on my calf muscles. I have done this exercise everyday for years now. My doctor also advised me to get good arch supports. Upon using those supports, that cost more than the cheap shoes I was wearing at the time, 90% of the pain instantly vanished. That led me to find some shoes that would work for me without added arch supports. For more on plantar fasciitis, see the discussion on the topic at Power to Explore. After skate shoes, I took the advise of the nice people at Roadrunner Sports and discovered ASICS Gel-MC Plus running shoes. While the shoes look a little like the cheap joggers, the price was around $100 and they were built much better. They also had sufficient arch support to eliminate the need for inserts. Wearing these shoes everyday led to the elimination of my issues with plantar fasciitis. That result is well worth the cost of the shoes. Running shoe designs are frequently updated with new models while old models are discontinued. The Gel-MC Plus shoes have been discontinued and something new has taken their place. Check with your favorite shoe store about current models that have the same attributes and test them out. While these shoes were great for everyday wear and even jogging, they still lack the ankle support that is required for back country hiking. That, finally, gets me to boots. I tried several brands of boots over the years including Outdoor Gear Hunter boots from my local Big 5 Sporting Goods store. As boots go, these were fairly inexpensive and resolved most of the issues I had with the shoes I tried. They are waterproof, insulated, and high enough to provide strong ankle support. Unfortunately, they lacked arch support, so I was back to using the inserts. If you are prone to plantar fasciitis, always be sure you have good arch supports – even if you are without pain. The boots, required some break-in time, but not much. These boots were also a bit warm for summer use. After using the boots awhile, I discovered they had a significant flaw. Their sole is a relatively soft rubber material. That generally makes for comfortable walking, but they were too soft to protect my feet from rocks. While the inserts I was using provided some additional protection, it wasn’t enough to prevent some pain that led me to visit a podiatrist. While there I asked about custom orthotic inserts. Custom orthotic inserts are specifically customized to address the exact issues that need to be corrected with your feet, however they cost a few hundred dollars. My podiatrist advised me to try Dr. Scholls Custom Fit Orthotic Inserts to see if they would work for me. These are not exactly designed to fit your foot, but there are several options to resolve your issues much better than a one-size-fits-all solution. I ran down to Wal-Mart where they have a machine that evaluates your feet and recommends a specific option. By standing on the machine in stocking feet, it can measure the pressure at points across your foot print. Based upon that information it recommends an insert option that will spread the pressure around as much as possible. I still use the $50 inserts in any shoes or boots that lack sufficient built-in support. They do the job for me. In looking around the web for better boot options, I came across Danner boots. I tried their ‘Radical’ model. These have leather uppers with breatheable fabric panels, waterproofing via a Goretex liner, and, while lower than the Hunter boots, enough height to offer good ankle support. They also have a solid sole that provides good protection from rocks. The reviews indicated they were pretty good boots although some people complained that the outsoles wore through too early. My local boot store recommended them, so I bought a pair. They needed no break-in and felt much like jogging shoes, in terms of weight and comfort, right out of the box. I enjoyed them greatly for a few months. At that point I learned that it was true – the outsole wears through well before the boots are ready for the trash. Unfortunately, this style of sole can not be repaired. I liked the boots in general so I studied the various Danner models to see which had replaceable soles. These boots sell in the $300 range. I bought a pair of Combat Hikers when I saw them in a local store for $99 per pair. Apparently these were popular with the military in Afghanistan, but had been discontinued – thus the low price. I understand they were redesigned slightly, with the addition of a top lacing hook and a different sole and are now sold as the “Crater Rim” model for $300. Unfortunately they cannot be resoled. That suits me for $99, but maybe not for $300. 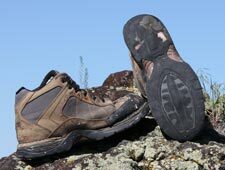 I later found that they won Outdoor Magazine’s 2012 Gear of the Year award for trail shoes. These boots have leather uppers, a vibram sole and Gore-Tex lining. They are well-padded while not getting too hot for summer use. They are the same height as the Radical’s and seem to provide about the same ankle support. I still use the Dr. Scholls inserts with them. 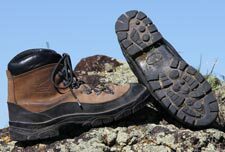 The Combat Hikers have been working great for me, but some reviewers say that they don’t hold the foot properly, allowing it to slide forward when walking downhill. This, of course, jams the toes and makes walking unpleasant if not impossible. It seems to me that there are two factors that come into play with this issue. First, fit. Be sure to wear the same type of socks you plan to use in the field when you try the boots on. Kick your foot forward against the carpet to see if you can force your toes into the end of the boot. If you can, tighten up the laces or try a larger size. This kind of experimentation works best at your local shoe store and Danner Boots are widely available locally, so buy them locally – it’s best for your community’s economy. If you do buy online, don’t be afraid to send the boots back immediately if they don’t fit correctly or are otherwise uncomfortable. Danner manufactures these boots in the USA (Oregon) and offers a broad range of sizes and widths so you can get the best fit possible. Second, lacing. Danner included a little diagram with my boots. It showed that the boots should be laced with the laces going under the D-rings as they come up the boot then over the fourth D-ring from the bottom. The photo to the right illustrates this pattern. This allows you to tighten the lower part of the boot to comfortably hold your foot and lock the tightness in place with that fourth D-ring. The third and fourth D-rings seem to be the ones that also hold your foot back from the toe. So, carefully tighten your laces and hopefully that will help hold your foot in the proper position. This photo also reveals one of the differences between the Combat Hiker, shown, and the Crater Rim models. 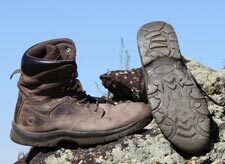 Where the Combat Hiker has an eyelet in the collar at the top of the boot, the Crater Rim has a hook. I lace my boots at the top as shown so I can tighten them properly at the top without the need for the hook. That’s just personal preference. Having said all that, no boot is likely to fit everyone properly. If you can’t get a boot to fit properly, try another model or brand. Almost two years later and I’m still wearing the Danner boots for hiking, but I’ve given up on the ASICS shoes. While the various iterations of the ASICS shoes discussed above always gave me the support I needed to prevent a recurrence of plantar faciitis, the uppers were wearing out much too quickly. I decided to give hiking shoes a chance for everyday wear. The Keen shoes caught my eye so I checked them out at the local REI store and bought a pair of Targhee II’s. These do not have the arch support I need, so I’m using the Dr. Scholls inserts with them. The main advantage over the running shoes is that they have leather over the toe where I tend to create holes. They have a very open tread with a great grip and they are waterproof. Obviously, as shoes, they won’t keep your feet dry wading in a creek, but the waterproof “Keen Dry” liner makes them great for walking around in wet grass. I also like the way the laces run through straps instead of eyelets or D-rings. If I happen to break a shoestring, paracord will work just fine with them. I’ve been wearing them everyday for awhile now and I see no signs of wear. I expect they will outwear the ASICS maybe two to one or more. That makes them much more economical even though the initial cost is a bit higher. I used to wear my cheap joggers without socks. Besides smelly shoes, that let to blisters and soreness, but as a kid, I didn’t care. Since then I have come to understand the importance of proper socks. I have been using cotton socks a lot as I like the way they work with my boots. However they don’t offer the advantages of wool (warm even when wet) or some of the synthetic fabrics (warm when cold, cool when warm, and wick dry). They provide the attributes I’m looking for, but they are not durable enough to suit me. At $9 a pair (sometimes on sale for $6 or $7), I want socks that are durable. While not perfect, they provide the best combination of attributes in a sock that I have found yet. My search for the perfect sock continues. Wilderness explorers must have healthy feet. That takes a good boot, proper arch support and appropriate socks. What works for me, may not work for you, so please comment below with your experiences, ideas, insights and suggestions. 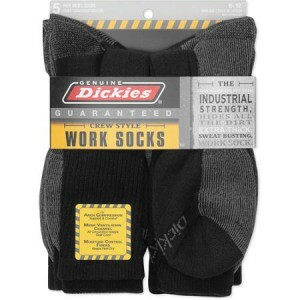 The photo of Dickie Socks is provided by the manufacturer. The text and the other photos are by Jerry Haugen, Pathfinder, and ©2013 Global Creations LLC. The foot diagram is modified from a Shutterstock version used under license. None of the companies mentioned in the article contributed any goods or funding for this story. REI provides financial compensation if you click the ads to the right and buy something from them. 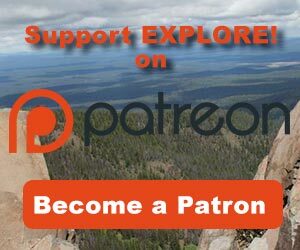 If you do buy from REI, be sure to become a member. 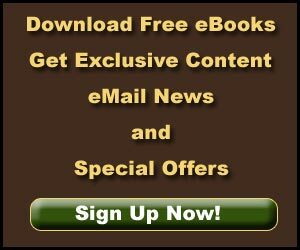 Members typically get around a 10% dividend on all purchases at the end of the year. I have a lot of the same problems and have used the same arch supports and have found some boots( dickies) to work for a few months at a time with the Dr Sholes inserts, Still looking for better arch supporting boots. I work on my feet 13 hrs a day on a concrete floor. I find your article helpful Thanks so much.